While the interface of the Android web browser has hardly changed, the hardware specs of the Samsung Galaxy S II for AT&T propel it to great heights of user experience. The large, sharp display with great colors makes reading a joy. The powerful dual-core CPU (and probably some GPU acceleration) enables the Galaxy S II browser to play 1080p Flash video embedded on webpages. That was truly impressive stuff – a lot of netbooks would choke on something like that. You can play touch-optimized Flash games without a hitch too. Hubs are not just for Windows Phone 7 – Samsung, at least, seems to think so. They’ve added two Hubs to their Android super phone. The Samsung I9100 Galaxy S II comes with Quickoffice preinstalled. It’s one of the most feature rich mobile editors we’ve seen. You can view and edit Word, Excel and PowerPoint documents and there’s a PDF viewer to boot. 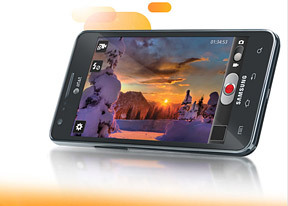 With a 1.2GHz dual-core CPU and powerful new graphics, the Galaxy S II can run every Android app designed for phones. The OS version is 2.3.4 so you won’t have any problems on that account either. After its recent major overhaul, the Android Market has become the place to go not only for apps and media, but also books, movies, etc. Its interface is simple and intuitive. The search function at the bottom right corner will assist you in finding anything you can possibly need. The Samsung Galaxy S II for AT&T comes with Kies Air preloaded. The app connects to the local Wi-Fi network (or it can create a Wi-Fi hotspot) and gives you a URL to type into your computer’s web browser.